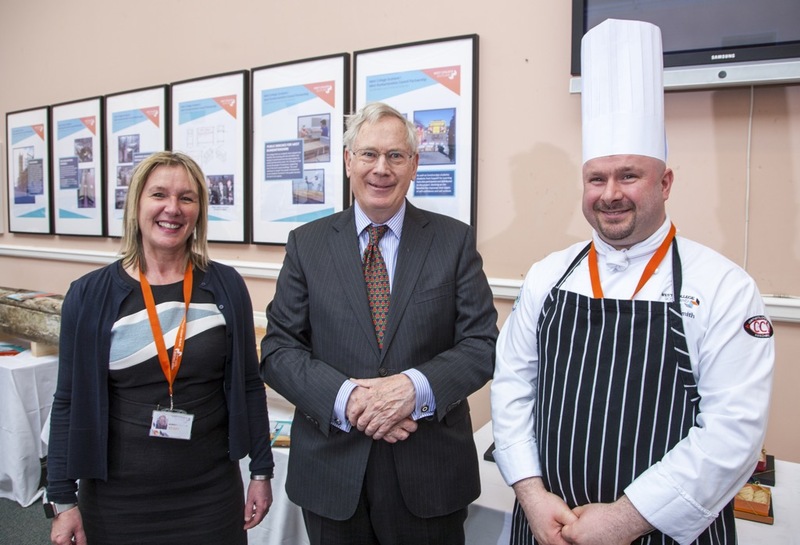 His Royal Highness The Duke of Gloucester visited West College Scotland today (Thursday 26 April 2018) to see how students are gaining the skills to preserve our built heritage, as well as designing modern homes for the 21st century. His Royal Highness’ visit was hosted by West College Scotland Principal and Chief Executive, Audrey Cumberford. The Duke’s first stop was at the Institute of Construction and Engineering (ICE) building on the Paisley campus, where he was able to see how old craft skills, such as slating, stonemasonry, lead bossing and carpentry are being handed down to a new generation of apprentices. Students, College lecturers, and industry trainers were able to describe to His Royal Highness how new technologies were assisting this process. “The Duke showed an interest and understanding of the important work we are doing. The west of Scotland has a large number of listed buildings and we are keen to make our contribution to maintaining them to the best possible condition. At the Abercorn Conference Centre, The Duke met some Photography students and spoke to them about their prize-winning portfolios. His Royal Highness was then introduced to the team behind the Designers of Tomorrow Project, a collaborative initiative between the College and the Glasgow-based architects, Neat Living. This award-winning initiative sees Neat Living giving “live” projects to Interior Design students, as well as mentoring them and providing feedback on their designs for modern, sustainable homes. The Duke also met the construction team involved in turning 150-year-old roof timbers into public benches for use in West Dunbartonshire. The beams of Oregon Redwood were salvaged from the Old Academy building in Dumbarton town centre and donated to West College Scotland. The efforts of the College’s Greenock construction team have ensured that the people of the area will continue to enjoy the benefits of this ancient wood.